Preheat oven to 350°. Line bottom of 9-inch square cake pan* with parchment or wax paper, then spray with no-stick cooking spray; set aside. Combine flours, baking powder, cinnamon, baking soda and salt in medium bowl; set aside. Beat Country Crock® Spread with sugars in large bowl with electric mixer until light and fluffy, about 5 minutes. Add eggs, one at a time, beating 1 minute after each addition. Beat in yogurt. Gradually beat in flour mixture, then zucchini, just until blended. Evenly pour into prepared pan. Bake 40 minutes or until toothpick inserted in center comes out clean. Cool 10 minutes on wire rack; remove from pan and cool completely. 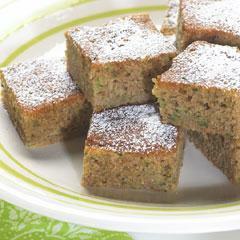 Slice into 16 squares and sprinkle, if desired, with confectioners sugar. *To make MINI ZUCCHINI SNAX MUFFINS, spray mini muffin pans with no-stick cooking spray with flour, then fill 2/3-full with batter. Bake at 350° for 15 minutes or until toothpick inserted in centers comes out clean. On wire rack, cook 5 minutes; remove from pans and cool completely. Sprinkle, if desired, with confectioners sugar. Makes 3-1/2 dozen.